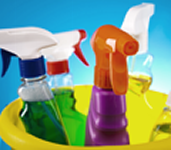 Green Cleaning Products | Sebastian Enterprises, Inc. When in Doubt... ShowTime it Out! When you need something clean, you need it clean—period. That seems to be the justification for using abrasive cleaners that are bad for the environment, but now you can have superior cleaning power in a green, all-purpose cleaner. Contact us today to start cleaning your home without harming the earth. Come to Sebastian Enterprises, Inc. for green cleaning products that will clean your house without harming your family or the environment. ShowTime is one of the first truly biodegradable cleaners. In independent laboratory tests, it actually surpassed the US government's standards for "ready biodegradability." Thoroughly safe to use, it is still incredibly powerful and concentrated and is perfect for multipurpose cleaning everywhere in or outside of your home, as well as vehicles. In a test of cleaning effectiveness, ShowTime cleaner scored 97%—far outperforming the brand name retail cleaner, which only scored 85%. It also costs much less than the leading brands. It truly is a win-win! "I use ShowTime cleaner on every tough stain in my home but had to hide it from my husband cause he kept taking it to work. This time I am ordering 3 bottles. 1 for him to take to work and 2 for me at home. Love the product. Keep it up ShowTime." "The other day I spilled some old english dark wood furniture polish on my beige carpet and started to freak-- til I remembered the ShowTime cleaner. I went and grabbed it and the stain came right up on the first try. I am very happy. I could not believe it took the black furniture polish up that quick and easy. Thanks ShowTime!" 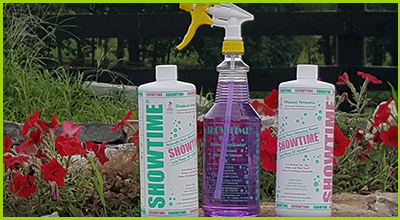 "I use ShowTime on everything and I would not trade it for all the cleaners in the world. It is the best I have come across." "I use ShowTime all the time. It is the best cleaner ever. I used it on my stove after I had a grease fire and it removed all of the soot and you couldn't even tell there was a fire. ShowTime gets rust stains out of my bathtub and blood stains from my berber carpet. I will never stop using this product. You can put this on your website. I want more!!!!" "I purchased ShowTime cleaner from a door to door salesman. I lost his card, but I wanted to let you know------ it is the only cleaner I have found to get betadine off of scrubs." "Have used your product cleaning my hotrod and am very impressed. How do I order more?" "A while back I bought a bottle of ShowTime cleaner to use on rug stains. Love it! But I have run out and need some. Where can I get some more? I live outside of puyallup, washington. Thanks." "I bought two bottles of your ShowTime cleaner yesterday and I have already used it to make bottles for cleaning my house. I am cleaning stuff that is not even dirty just to see if it can get any cleaner. I love this product! I travel a lot with my husband because of his job and I know people from west virginia, where I am from, would love this product. Is there any possible way I could acquire a job opportunity with your company? I would like to promote it on a website of my own. I am a mother of two young ones and can not travel. Please let me know. Thank you." "I own a 1934 ford 5 window coupe hot rod and use your product to clean my engine. 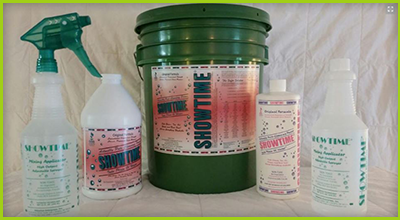 I have found nothing better, more reliable, or easier to use than ShowTime cleaner." "My cousin in Northern Michigan bought your product from a door to door salesman and just raves about it. How can I get some?" "I just wanted to tell you that one of your sales reps came into our shop today and I wanted to hire him for our sales team! What a great salesman!! His first name was kevin, and I believe his last name was polston. I just had to tell you how great of a job he did!" "Your company sent a sales rep to our county shop in wewoka, oklahoma. At that time we bought some of your product. The foreman here is interested in buying some more of your product. But we do not have the card for the rep that came here. Can you have someone contact us so that we can buy some more? Thank you." "I would like to order more ShowTime!! I lost the order form from when I purchased it last summer at my door. Please help-- I am in green bay, wi and the owner of my job really wants to purchase this product. We love it. Thank you." "I love the product. Have made bottles for all my friends to try. I have a bottle made up in every room of my house. Will never use store cleaners again. Thanks ShowTime." "Over a year ago I bought ShowTime from a door-to-door guy. Would like more. Please contact me...Thank you very much. It is by far the best product I have used in my life." "I have looked everywhere for a product to match ShowTime. Still have not found it yet. Your product can not be beat. Thanks again." "I tried a free sample of ShowTime cleaner that was given to me at a biker function. Used it on bike and truck and will never be without it again. What a cleaner." "I have bought this product from a door-to-door salesman and then re-ordered online also. I would like to get for use at my workplace, but we need an msds sheet. Please send us one so we can make sure that we can use the product in our medical facility. It is the only cleaner I can find to remove betadine from our lead aprons and clothing."